Gingerbread house with white frosting roof. A snowman and candy tree sit in the front yard. Includes a C7 electric light cord to light up the inside of the house. 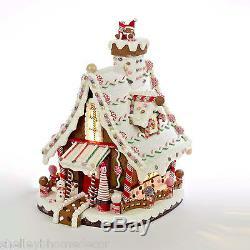 Here is a link to shop for more candy themed Christmas decorations at Shelley B Home and Holiday. Purchasing multiple items from Shelley B Home and Holiday? Here is a quick link to sign up for Shelley B Home and Holiday emails. To receive updates on new items and sales. The item "Gingerbread Candy Christmas House w Icing Roof 12in clay dough NEW ka j3628" is in sale since Wednesday, August 31, 2016. This item is in the category "Collectibles\Holiday & Seasonal\Christmas\ Current (1991-Now)\Villages & Houses". The seller is "shelleybhomedecor" and is located in Myerstown, Pennsylvania.